This congregation in danger going through a major split. Some of the reasons for the split concern controversies over worship. Divisions within the membership are playing out in the worship and some are introducing disruptive practices into the worship. Others are altering the practice of the Lord's Supper. Of course the problems go beyond worship. There are doctrinal controversies. Some of the leaders in this congregation have been advancing unbiblical views of baptism. The doctrinal controversies are closely associated with moral controversies. The congregation has become woefully tolerant of certain forms of sexual immorality and their teaching on divorce and marriage is not consistent with biblical teaching. As one might expect, such a congregation is suffering from people who are separating into factions. These factions are centered around the teaching and ministries of well-known teachers in the brotherhood. This conflict is threatening to tear this highly visible congregation asunder. The word of the cross is foolishness to those who are perishing, but to us who are being saved it is the power of God. For it is written: "I will destroy the wisdom of the wise; the intelligence of the intelligent I will frustrate." Where is the wise man? Where is the scholar? Where is the philosopher of this age? Has not God made foolish the wisdom of the world? For since in the wisdom of God the world through its wisdom did not know him God was pleased through the foolishness of what was preached to save those who believe. Jews demand miraculous signs and Greeks look for wisdom, but we preach Christ crucified: a stumbling block to Jews and foolishness to Gentiles, but to those whom God has called, both Jews and Greeks, Christ the power of God and the wisdom of God. For the foolishness of God is wiser than man's wisdom, and the weakness of God is stronger than man's strength. Consider your own call, brothers and sisters: not many of you were wise by human standards, not many were powerful, not many were of noble birth. But God chose the foolish things of the world to shame the wise; God chose the weak things of the world to shame the strong. He chose the lowly things of this world and the despised things -- and the things that are not -- to nullify the things that are, so that no one may boast before him. It is because of him that you are in Christ Jesus, who has become for us wisdom from God--that is, our righteousness, holiness and redemption. Therefore, as it is written: "Let the one who boasts boast in the Lord." It is moronic and foolish -- Paul said the Greeks demand wisdom. They wanted logical proof. They believed in certain categories and criteria and God in Jesus did not fit those. Why would God die? Why would he sacrifice himself to save others? How can the death of a man condemned as a rebel and bandit save the world? Why do we need saving? 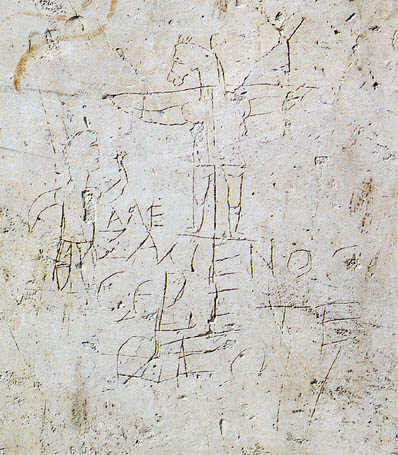 Alexandros graffiti - Christianity was not understood in the first-century. It was viewed as a religion for reprobates and lower classes. It was ridiculed. It has the power to destroy other powers. The word of the cross reveals something that shakes the foundations of all other powers. It proclaims and represents a God doing something so unique that every influential power and principle is redefined. Words have that power to create and destroy and recreate. Nothing is the same now that this has happened. There is rhetoric about the political shifts due to 9/11. It has become a decisive event -- pre 9/11 and post 9/11. Is it any wonder why our calendar systems used BC and AD -- a new rule is in effect! Our past and future: The Corinthians needed to look back at who they were when God called them. It is God's modus operandi to work with those we overlook and reject in our earthly wisdom. Why do we let our past define us when the word of the cross redefines our past? Who among us can truly secure our future? All the best planning and work can be undone in seconds. What wisdom secures the perfect future? Why do we let our efforts for the future define us when the word of the cross defines our future? Our worth and identity: The Corinthians were divided. They were finding their identity in human leaders and the acceptable things of this world. Their identity was based on their philosophies. What about our divisions and categories? [In 1832, Racoon John Smith proposed unity between the Campbell churches and the Stone churches. Mentioning some of the terms and issues that divided them he said, "Let us then, my brethren, be no longer Campbellites or Stoneites, New Lights or Old Lights, or any other kind of lights. But let us come to the Bible and the Bible alone, as the only book in creation that can give us all the Light we need."] But now almost 200 years later, what terms separate us? Is that the Word of the Cross? What about our backgrounds and our status? What makes us wise? What gives us power? On what basis do we find unity -- The Mac Pruitt story -- There's a VP at Dow come to visit a union man -- Those who are being saved have a worth and identity that seems foolish to the world. Our values and allegiances: Those who are being saved have allegiance to God even when it is risky and seems foolish. Carl Spain -- race and ACU's policy not to admit African American students pre 1961 -- "Do we fear Jim Crow more than we revere Jesus Christ?" Jim Elliot -- Through the Gates of Splendor "He is no fool who gives up that which he cannot keep to gain that which he cannot lose." Believing in the Word of the cross is the first challenge. But conforming to it and living it out is the greater challenge. Accepting the very different Word of the Cross is the first challenge, having that mind of Christ is the next challenge -- and both require the wisdom of the Holy Spirit. The Tightrope Walker -- A man walked a tightrope across a windy ravine very slowly but made it. People gathered around and that tightrope walker asked the crowd, "Do you think I can cross the ravine again?" There was great applause and every one shouted their confidence in the man. Then he asked, "Well, who then will go with me as I carry you on my shoulders?" It t____________ our established assumptions. It is counter-intuitive to our typical ways of k____________ the world. It c____________ our sensitivities and assumptions. It is s________________ and o__________________. It is m_______________ and f___________________. It has the power to d____________ all other powers. It has the power to create new r_______________. Words have power to c___________. The Word of the Cross redefines e___________________ (1:26-31). It redefines our p________ and our f__________ (1:26). It redefines our w________ and our i__________ (1:27-29). It redefines our v__________ and our a_______________ (1:30-31; Jer. 9:23-24). B________________ in the Word of the Cross is the first challenge. C________________ to the Word of the Cross is the greater challenge. Before you get together with others tonight or this week, read 1 Corinthians 1 and 2. Describe the problems in the Corinthian church. Do we have similar problems in our church? How are our problems like and unlike theirs? What problems do we have because we use the world's ways of thinking? How does the Word of the Cross speak to the problems in the Corinthian church? How does the word of the cross speak to our problems? The crucifixion of Jesus is an "event that sends a message." How does that message change everything? How does it redefine our lives? If you were to focus daily on Jesus and the Word of the Cross, how would you change? How would it change your view of the world? Why is the word of the cross power? 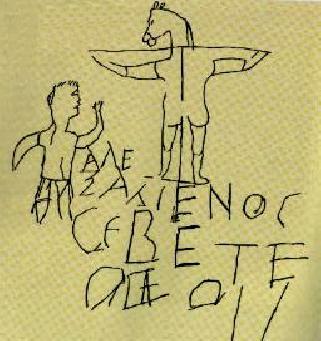 The first century graffiti showing a donkey on a cross demonstrates ridicule of the early Christians. How are Christians ridiculed in our world? How could our gospel ("good news") be considered offensive or foolish? Upon what do you base your self-worth? What shapes your identity? Even if you say Christ, are there other principles, philosophies, or influences that "fill in the gaps." Are these consistent with the Word of the Cross or does the fact of Jesus' death, resurrection and Lordship nullify these other "words"? What demands your devotion? What gains your allegiance? How does the cross test your values and allegiances? If you need to change your mind and change your ways who will you go to for help? Why do you worship? Why are you a disciple? What demands your time, resources, and passion? Does it fit the wisdom of the world or of the cross? Prepare for Oct. 10 - "Proclaiming a Biblical Worldview - Part 1"
Read 2 Corinthians 10:1-5, Matthew 5, Philippians 3.